Available for performances after March 2019. John Harbison's absorption in the music of J.S. Bach has been a lifelong touchstone in all of his work: as conductor, performer, composer, teacher, and scholar. His new book, What Do We Make of Bach?, comprises a series of short pieces: Portraits — encounters with individuals revolving around Bach’s work; Essays — experiences with institutions in which Bach was at the core, together with some thoughts about where Bach's music could take us, now; and Program Notes — from many written over the last sixty years, a few chosen to light upon the aesthetic and social issues Harbison feels are most important today. The book is being released coincident with the premiere of Harbison’s new organ symphony of the same title, What Do We Make of Bach?, a co-commission of the Seattle Symphony and the Minnesota Orchestra, together with Northrup at the University of Minnesota. This piece of music began with its title. It also began with the assumption that along with the music I would write a short book with the same title. I started them both simultaneously, and they remain closely linked in my mind, each half of the project explaining the other. I thought of the piece as freely representing musical types found in Bach, reimagined in our still new century. The score takes note of some of these as they occur: Chorale-Variations, Fantasia on "borrowed subjects" (actually Bach themes in retrograde), a pair of Cadenzas evoking Bach's improvisational side, Canzone (an instrumental aria), Antiphon, Chorale, and Fugue. A suggestion early in the process from Ludovic Morlot encouraged me in a direction I had begun to consider, the inclusion of an obbligato organ part. Perhaps the organist's role sometimes represents a dialogue between Bach and the composer of this piece? The timbre and presence of the instrument serve as a constant reminder of the dangerous and often exhilarating suggestiveness of the piece's title. In many ways the book, What Do We Make of Bach?, is an extended comment on the piece, sharing with it a relationship to Bach's music both obvious and oblique. It consists of Portraits — encounters with individuals revolving around Bach's work; Essays — experiences with institutions in which Bach was at the core, together with some thoughts about where Bach's music could take us, now; and Program Notes — from many written over the last sixty years, a few chosen to light upon the aesthetic and social issues I feel are most important for us today. Since few will likely avail themselves of both of these sources, much as this might be encouraged, I have taken some care to make both halves freestanding. Each plays a role in summarizing a lifetime preoccupation. I do not consider either to be in any way a Tribute or Homage. For me Bach has always been too fundamental, too elemental for that — instead it is something to use, to make something of, to add to the stream. I would like to acknowledge the support of the commissioners of the piece — The Minnesota Orchestra, the Seattle Symphony, and Northrop at The University of Minnesota — and the organists of its first performances, my publisher Associated Music Publishers, and above all my assistant Sarah Schaffer, who achieved publication of the book, and never, in spite of the oddness of the whole venture, expressed anything but hope and curiosity about the outcome. 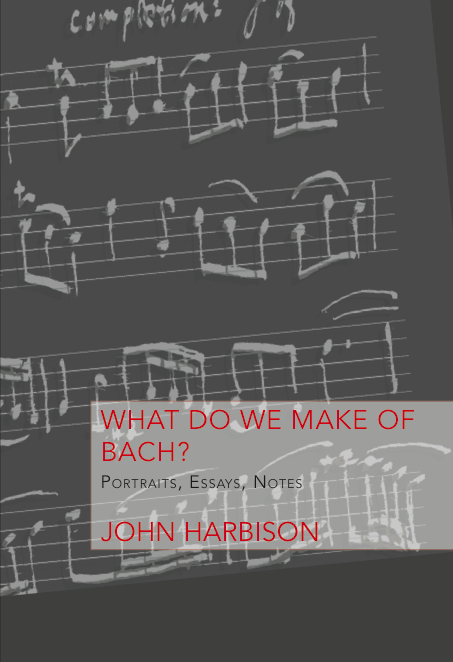 In John Harbison's What Do We Make of Bach? a new work co-commissioned by Northrop, the Minnesota Orchestra and the Seattle Symphony, the organ's voice emerged with vernal freshness and a tingling clarity of texture. The pipework, located above the proscenium arch, remains invisible. But the constricted wooden grilles of old have been replaced by mesh-like membranes which allow the sound to flow out in a more open, organic fashion. Harbison's colorful writing for the organ in What Do We Make of Bach? was counterpointed by striated figurations in the strings, skewing perception of the great composer through the more agitated sensibilities of our own era. Paul Jacobs displayed sparkling fingers in the cadential passages but kept his most dazzling work for the Bach fugue that he played solo as an encore. In that piece, he really put the Aeolian-Skinner through its paces, paring off dynamics to the merest whisper, then unleashing a tidal wave of volume on the final cadence. Would Bach have played the piece like that? Probably not. But the overall effect was undeniably thrilling.